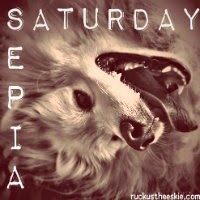 Ruckus the Eskie: Sepia Saturday #102: Just Smilin' At Ya! We sure can tell you ARE looking forward to it Ruckus...always smiling!! Happy Weekend!! You look so happy and content! Smiles right back at you! Hi Ruckus! Hope your weekend is enjoyable. We just love your smile Ruckus!